A little bird flew into the EDM office window this morning chirping very quietly in my ear, it was so quiet it was nearly a whisper. But when I turned the music down enough I heard what all the fuss was about. Rumor has it Yamaha has finally opened it’s ears and is beginning to listen to consumers regarding 2-strokes, namely the YZ144. If this is indeed true, this would mean Yamaha will be releasing a “new” 2-stroke model to the US in the relatively near future. While this is just a rumor, could this bit of news hold a glimpse of the future for MX? Could it be that the OE’s might find a new surge of interest for the 2-stroke engine?… We at EDM certainly hope so. 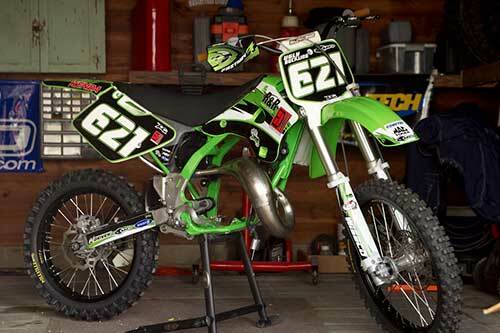 It would be very good for the sport, not only are 2 stroke lighter and more fun to ride. They are substantially easier to work on, and engine parts are more affordable. 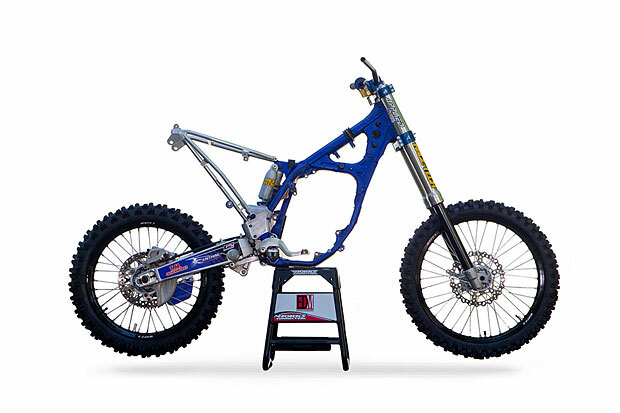 It’s ironic this news should come on the very day we sat down to write an article on building your own YZ144. A feature we have been putting together since late August, 2010. Through the summer months we had been going back and forth with the folks at Athena USA about installing their 144 kits on a 125. We just needed a 125 to perform surgery on. 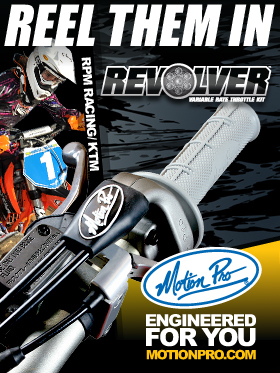 According to Athena our bike option for the 144 kit is either a 2003-2007 KX125 or 1997-2010 YZ125 (97-04 and 05-010). 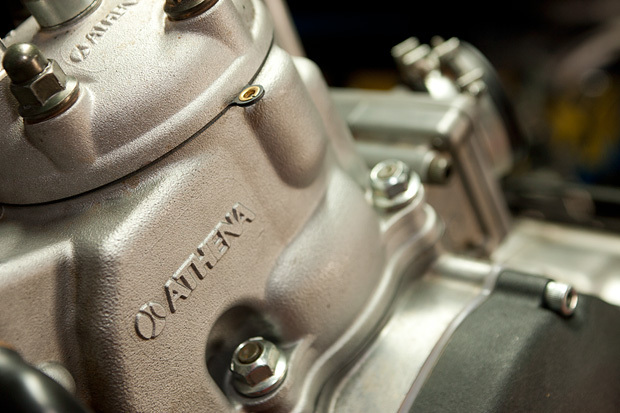 Apparently Honda and Suzuki made too many changes to their motors each year for it to make sense for Athena to make kits for them so you Honda/ Zook owners out there are out of luck with Athena. This made for the easiest choice we had to make for the entire project. The KX125’s, as great as they look, were not an option since most of the years they were made are green painted turds that are so slow you smell your own exhaust when you ride them. Yamaha has been winning 125 shootouts since the days when Kevin Windham was winning races on them them. 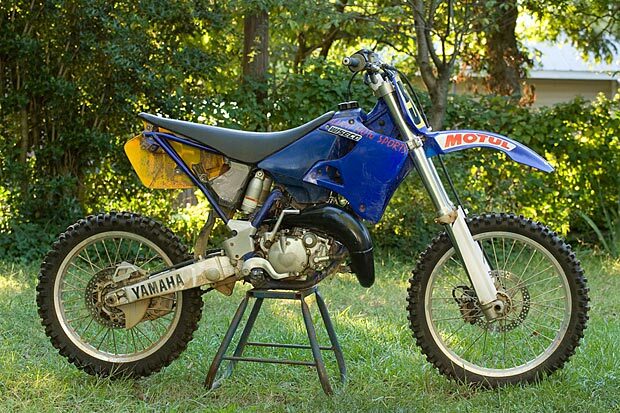 Starting this project on the right foot was pivotal to its success and we knew with confidence that just about any year YZ125 from 98 through present day would be a great platform for the 144 project. The idea here is to build a moderately powered, super light, fun, flick-able bike that we can tear through the woods on. If you have never ridden a 125 on tight single track trails, you really ought to find a way to give it a try. Once you do you’ll be hooked and want one of your own. It takes a bit of practice but, once you get used to resisting the temptation to up shift, the 125 motors do produce quite a bit of power, certainly enough for spirited trail riding. You just have to keep them on the pipe and in the power band. This is what makes riding a 125 such a treat, 125’s produce the kind of power that can easily be managed, even by less experienced riders. On most tracks, especially these days, a 125 feels anemic and it seems like you hit the throttle stop in every gear. But on trails it’s a completely different story. And what could be better than flying along your favorite trail flicking a super small, bike around corners and over rollers that weighs, with a full tank of gas, less than 210 lbs? It’s almost like riding a mountain bike except there is none of the obnoxious pedaling or huffing and puffing up the hills! It’s a complete turd of a bike with leaking fork seals, frozen links on the chain, broken teeth on the rear sprocket, a bent handle bar and sub frame. The incomplete plastic was faded, scratched, and stained. The cylinder was equally ugly with nasty deep gouges from a seized piston, which was missing. The previous owner got custom and made a shorty muffler out of the stock unit – saweeet! With all its short comings it was perfect! No one in their right mind would be interested in this bike… You can pick up a running 99 YZ125 for around $1,000 and it would probably look a bit better. The only reason this bike made sense is because we wanted to build a project bike with it. This project is based entirely on the installation of the Athena 144 kit, which includes a new cylinder and head, piston, wrist pin, circlips, and gasket set. We set out to build a woods ripper that YOU or anyone can build in their garage with a modestly sized workspace and a small amount of mechanical ability. All of the parts we use are readily available and can easily be installed with a decent set of tools, patience and a service manual. As usual we use one from Clymer. In Part I of this feature we are going to take a look at the bike we are starting with and some of its issues. In Part II we will look at the changes we want to make and why we want to make these changes. In Part III we will implement the changes, go for a test ride, and include a list of all the vendors so you know where to go when you are ready to start your own Woods Ripper. We hope you’ll come along with us and get inspired to build you own! Click on any of the images for a larger version. Our project bike had been sitting for 3 or 4 years. The seller wanted to “fix” it but just could find the time so it sat. He bought it not running and just wanted to get his money out of it. This didn’t leave much room for negotiating but $400 seemed like an OK price for what we were getting. 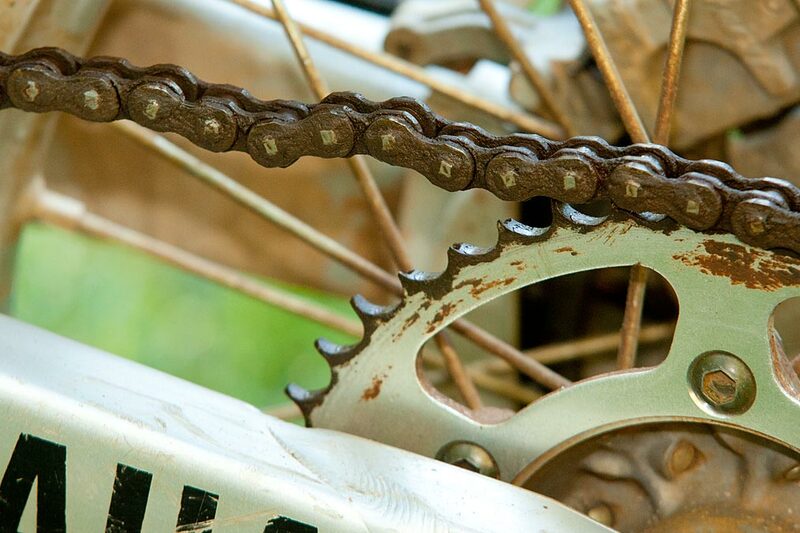 This chain and sprocket are nothing short of appalling! A non O-ring chain should never freeze like this. 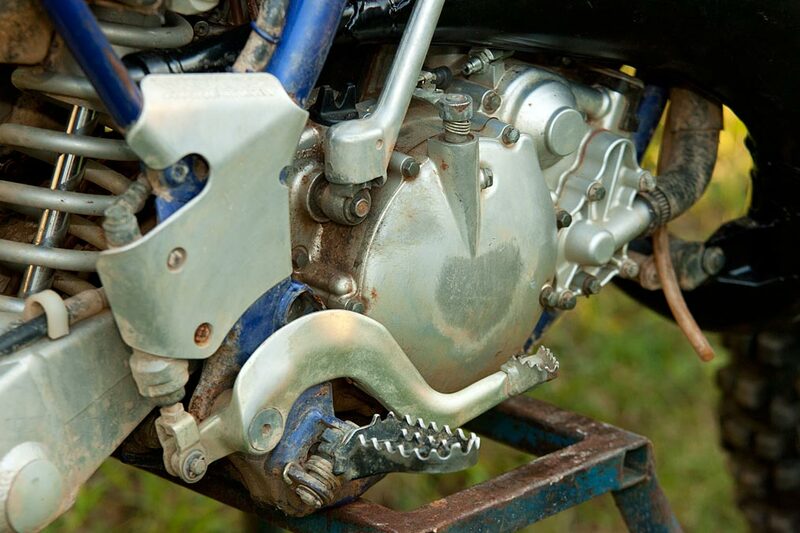 Take a close look at teeth on the sprocket – mmmm special. 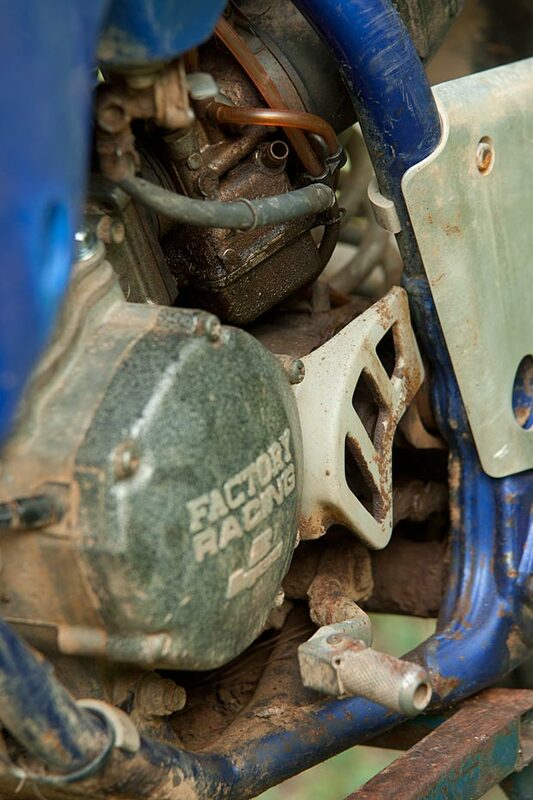 As you are looking you might just notice the chain and sprocket are the stock units… Interesting. How long did you say the bike was sitting? 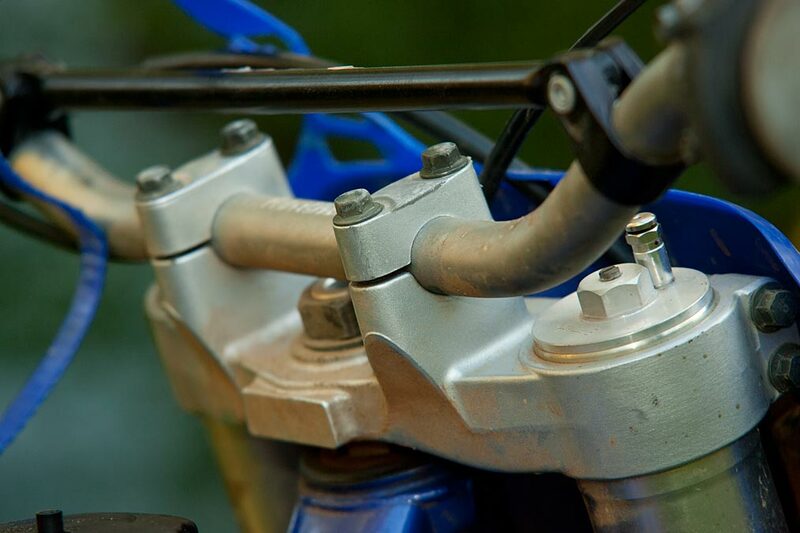 Leaking fork seals, worn bushings, and nasty gray fork sludge a.k.a. fork oil lurk behind this picture. Note the routing for the brake hose. Can you say help, Ride Engineering? Solid mount triple clamps? Come on Yamaha, what if we want to run a Fat Bar? 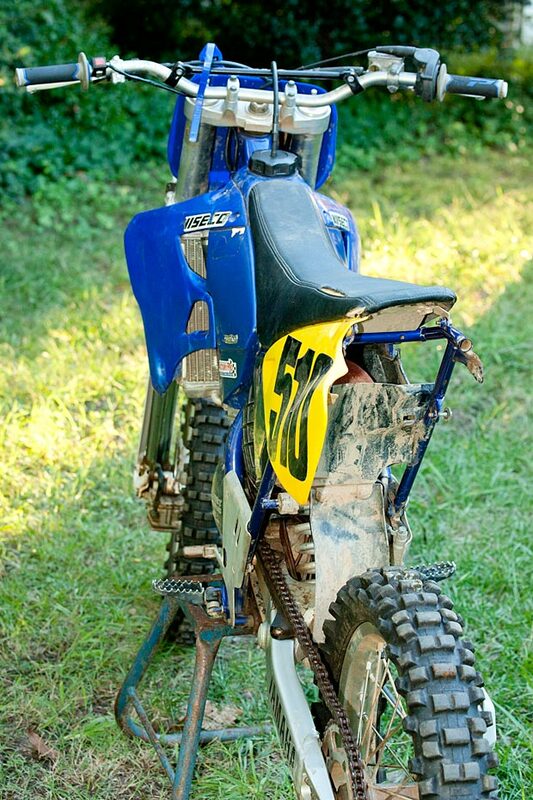 It is always amazing to us when we do these kinds of stories how jacked up a used bike can get. Before we commit to making a purchase we look at several and we’re surprised by just how many bikes out there are so painfully neglected. At some point all bikes we’re shiny and new and as the owners’ prized possession, were proudly displayed or ridden for all pals to see and often hear. If you are one of the people we are talking about who neglect their bike. Are you not worried about it falling apart as you ride it? Or worse, because of a worn sprocket, having the rear wheel lock up just as your front wheel leaves the up-ramp of a decent sized gap jump? Proper care and maintenance is a cheap insurance policy. If you can’t afford to have a professional mechanic work on your bike for you, few can these days. Buy some tools, get a service manual, and start tinkering. Start with easy stuff like lubing your cables and adjusting chain tension. You will get to know your bike better and your riding experience will improve greatly. 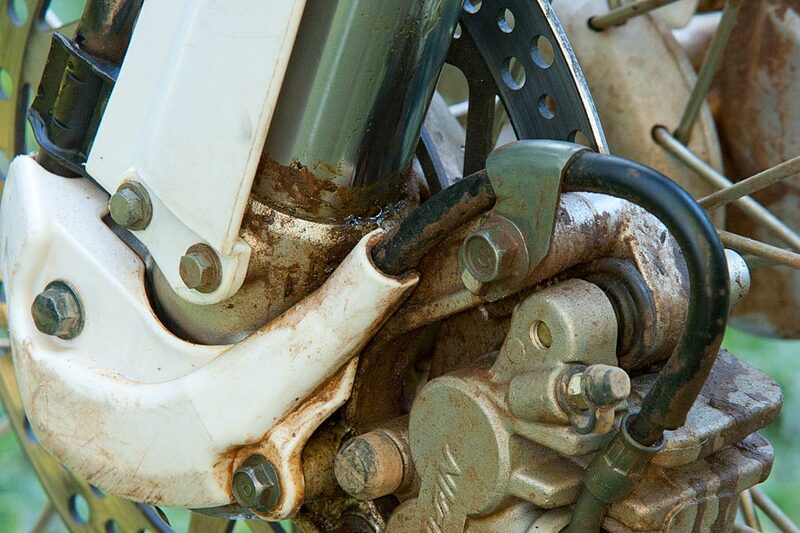 There is no excuse for a poorly maintained motorcycle. As you can see from this photo the carb on our YZ was looking particularly nasty. It looked as if the the previous owner had never washed the bike since it rolled off the showroom floor, leaving a dense, sticky coating of crud on everything. Based on the external state of the bike we were dreading what we would find at the swing arm pivot, in the headset, and motor internals. Judging from the outside, it was going to be ugly, really ugly. It’s time for a good wash and a closer inspection to determine where we will start. But for now it will have to wait. Be sure to check back and catch the second part of our Woods Ripper Project. The Woods Ripper That YOU Can Build – We Build It Part III – The Chassis The Woods Ripper That YOU Can Build – We Build It Part II – The Motor KX 125 Re-Build – The Ugly Duckling MONSTER ENERGY KAWASAKIâ€™S Nathan Woods earns another podium in Hollister Living The Dream … Going to the 2010 YZ450F Press Intro MONSTER ENERGY KAWASAKIâ€™S WOODS VICTORIOUS AT FINAL WORCS RACE How To Build a Motorcycle Wheel 12th Annual Fall Trail Ride Loretta Lynn’s Ranch Presented by Southern Woods Rider Inc.